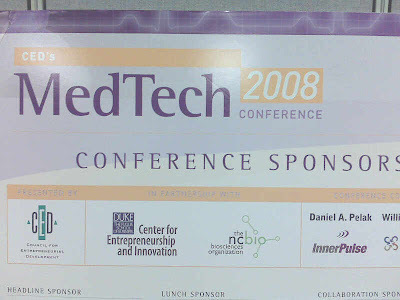 We were proud to help the Council for Entrepreneurial Development (CED), one of the largest entrepreneurial support organizations in the country, host the new MedTech conference, focused on medical device innovations. The Research Triangle area has a lot of strengths in this area. This conference will hopefully be a focal point for years to come, just as CED's Venture Conference, Tech Conference, and Biotech Conference have been great events for over 20 years here in the Research Triangle. Notable speakers included Richard Stack, one of the founders of Synecor, which spun out of Duke and has already created and sold about three companies with a total market cap of over 500 million dollars. Also, the former president and CEO of Guidant Corporation, Ronald Dollens, gave a wonderful talk. This event was held at Fuqua.